It’s been a crazy month for me, so I wanted a bit of a pick-me-up sewing project. This pencil skirt was perfect. I saw this silk and cotton graphic print at Mood Fabrics online (no longer available, but I think these silk twills from Mood might be similar) and just had to have it. At first I was envisioning a mini skirt, something like Vogue V1247 (previously made here). But, even though I’d swatched the fabric, I was still surprised by how big the print was when it arrived. 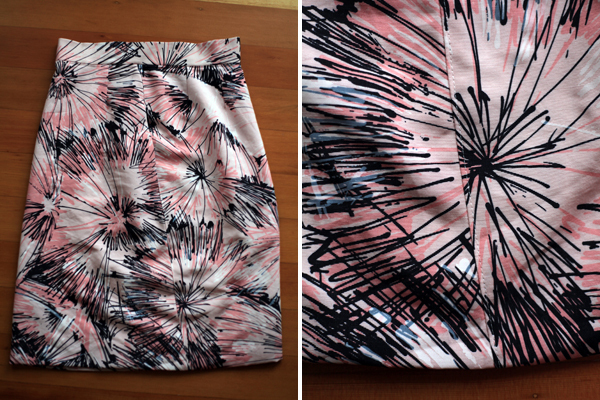 It would have been nearly impossible to get a full flower burst into the skirt I had in mind. Draping the fabric on my dress form convinced me that I should keep thinking narrow skirt, but in a longer length – a pencil skirt instead of a mini skirt. My go-to pencil skirt has always been BurdaStyle’s Jenny basic skirt (previously made here and here), but this time I wanted to try something new. I started digging through my pattern stash and came up with Vogue V1093 from the Donna Karan Collection. I liked how the slanted side seams hid little pockets in what I imagined was a much more natural position for my hands than the typical straight-up-and-down side seam pockets. See how the side seam starts farther forward at the top and then angles backward as it moves down? 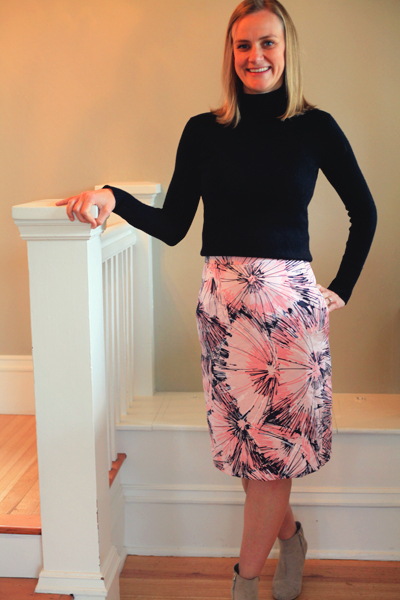 The look was even more dramatic before I chopped off quite a few inches from the length after deciding I wanted the skirt hem to fall right below the knee, not mid-calf as per the pattern. The fabric sewed and pressed nicely. Well, everywhere except for the seam allowances right around the pocket. They did not want to stay pressed open. I was about ready to cut out the pockets in the hopes that that would help when I realized the problem could be solved by just pressing all of the side seam allowances towards the back and top stitching them down. I used my edge stitch foot in order to get an even line of stitching, and voilà! I became the proud owner of two smooth side seams. The pattern actually called for lots of top stitching, but I omitted it everywhere else since the little bit at the side seam is hardly even noticeable amidst all of that crazy print. The back closes with a perfectly-inserted-the-first-time-around invisible zipper. I’ll admit that I usually get a weird little bubble at the bottom of my zipper after inserting it by machine, which I then go in and fix by hand. This time I took my time and followed the instructions to a T, and I may have done a tiny little happy dance when I realized how well it came out. It’s the small things, right?! There’s also a back vent. And, even though it added a bit of hand work, I opted to line the skirt. 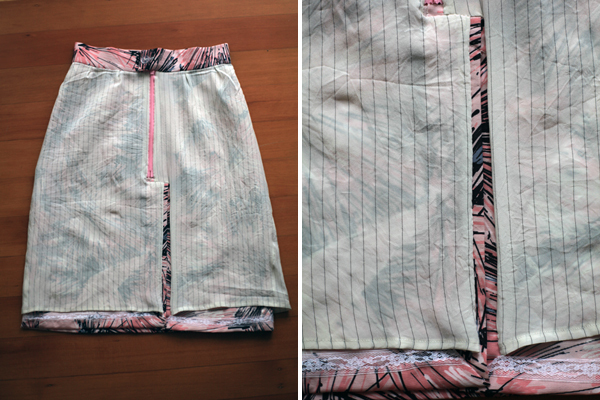 Since the skirt wasn’t intended to be lined, it didn’t come with any extra pattern pieces. 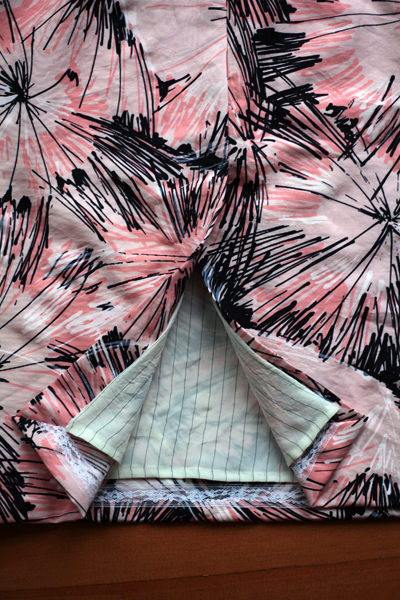 So, I just cut identical front and back pattern pieces out of my lining fabric (the same silk crepe de chine I used to make this top, which, by the way, I finally got unwrinkled by accidentally drying it in the clothes dryer), converted the darts to pleats and sewed the side seams at 3/8″ for a little extra wiggle room, and then hand sewed the center back seam to the main fashion fabric to keep the zipper and vent functional and the lining in place. I may have had a slight slip of the scissors when trimming the lining, which you can see on the right side of the left photo above, losing about a half an inch. It’ll still do its job though, so I didn’t lose any sleep over it! I sewed a bit of hem lace to the bottom of the skirt, turned it up, and catch stitched it into place. Oh! That reminds me. When you catch stitch a hem, do you grab tiny bites of fabric from the wrong side of the hem and the wrong side of the skirt, both below the top of the hem, so the hand stitching doesn’t show from either side? Or, do you grab tiny bites of fabric from the right side of the hem and the wrong side of the skirt, reaching up above the hem with the latter, so the hand stitching shows from the inside? Do my descriptions even make sense?! I do the former, but this month during the #bpsewvember Instagram challenge (which, sadly, I knew I just couldn’t keep up right now), I saw many pictures of the latter, so I figured I’d ask. I can’t remember where I learned the method I use, so perhaps I’ve gotten it wrong?! I stabilized the waistband with a bit of horsehair canvas from Joann Fabrics. 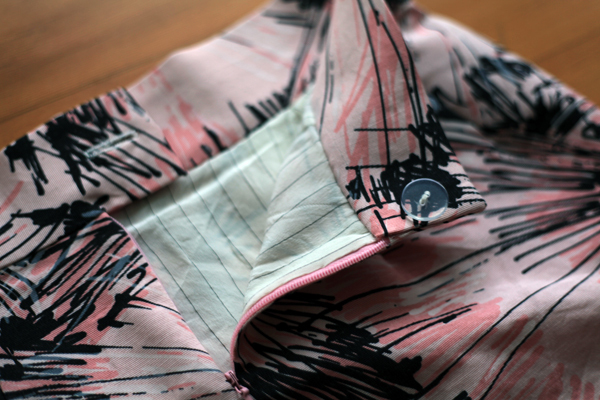 Finally, to close the top of the skirt, I went for a hidden button. I picked up the button at a fabric, patterns, and notions giveaway here in Seattle the very day I was hoping to finish up the skirt. I wanted to put something from the giveaway to use right away, and this button seemed just the thing. When the waistband is closed, you can’t see the button since I sewed it so it faces inside. It’s a little secret that will always remind me of the generosity of this community. Here’s to many more successful pick-me-up projects! And, happy Thanksgiving to those of you in the US!